Recorded near the end of our first American tour in Chicago's beautiful new club 'Constellation'. This group works with new repertoire on each tour and our sound continues to evolve. This is our fifth recording. "Moore's main in-semble since 2007 is the Fragile Quartet, with a couple of conservatory-trained players a generation younger than the Michaels, pianist Harmen Fraanje and bassist Clemens van der Feen. The leisurely Live in Chicago is their fourth Ramboy (after Fragile, Amsterdam and Easter Sunday), nicely recorded by David Zuchowski before a considerately quiet audience at A'dammers' newest second home, Constellation. The leader's clarinet ballads have a calm depth and beauty he'd been honing before he heard Jimmy Giuffre's melancholy little groups – not that Moore didn't take to that music when he did hear it. Any listener longing for clarinet in a Giuffrean vein should delve deep into the Ramboy catalog (starting, say, with the 1993 Moore-Fred Hersch-Mark Helias trio Chicoutimi). Moore's round full-moon chalumeau tone may be the loveliest clarinet sound around, but he doesn't shy away from the upper register the way Giuffre did, and he's got a scrappier sensibility. There are a lot more birdcalls in his conception; the avian abstractions can give spare bits a Morton Feldman bite ("Gauzy") or cool distance ("Go to gate," "In the moon"). The rhythm players are crucial to those effects; Fraanje and Van der Feen show commendable restraint – no agoraphobia – and the touch to dramatically foreground or background their contributions in the moment. "Sonora" is that plaintive sonority with a beat, from Vatcher on what sounds like his egg-sized shakers, before he raises up his trademark hollow-platform march beats and crossed-up cross-rhythms. The drummer likes very small and quiet gestures, but when he puts the pots on in a straight ahead setting, he can be an effectively disruptive presence, careening a little within his lane. He has a very elastic ride cymbal beat. Vatcher loves a broad range of percussive possibilities, lugging around a dulcimer/zither to hammer on, or to rotate a cymbal against the strings. He uses it to shimmering effect on "A few seconds (of overwhelming harmony)" where clarinet's backed by high pure long tones involving EBows that set strings a-humming, and Van der Feen's precisely bowed bass harmonics. "Triptych" begins with an ascending minor third sounded three times, revamping the start of "Mood Indigo." That triptych's other panels are an Iranian/Irish jig with dulcimer sounding like a santur, and a stage-exit sleepwalk. The plaintive, out of tempo first section of "Seascape," before the kicking main theme, functions like the introductory verse of a Broadway ballad (though it comes back at the end, un-versy). As "Seascape" demonstrates Moore can be lyrical on alto too, but he also uses it when he needs an abrasive edge or razzing tone – as on "Boogie man," one of his grand swingers, catchy and a little sarcastic." Kevin Whitehead - Point of Departure, June 2016. 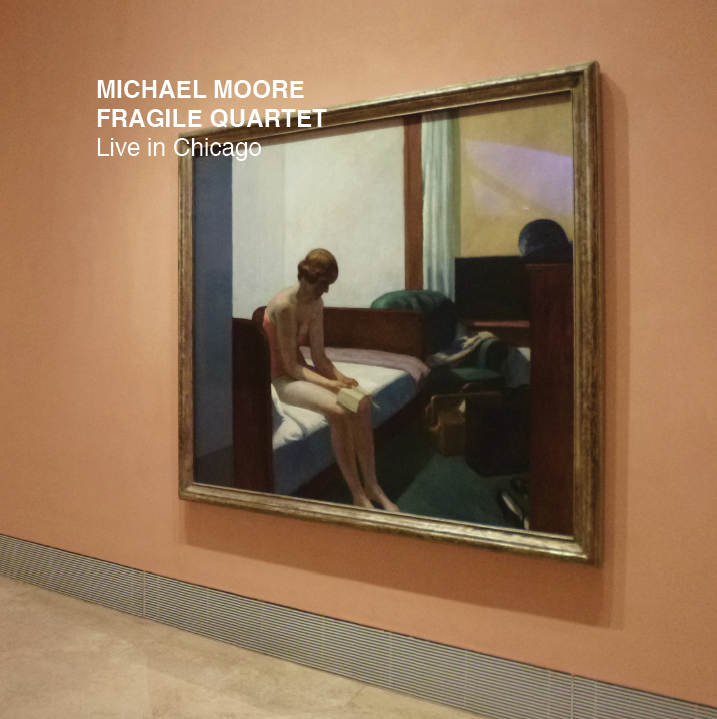 Aan het einde van hun Amerikaanse tournee in 2014 maakte het Michael Moore Fragile Quartet, dat al vier cd's uitbracht, opnames in de nieuwe club Constellation in Chicago. Het ensemble speelt negen nieuwe stukken, allemaal afkomstig van Michael Moore. Muziek die buitengewoon subtiel is maar nooit sentimenteel wordt. De vier musici wandelen op kousenvoeten over eierschalen. Er vallen veel stiltes waarin je een speld kunt horen vallen. Grote eisen worden er gesteld aan zijn begeleiders: pianist Harmen Fraanje, contrabassist Clemens van der Feen en drummer Michael Moore. Opvallend is het spaarzame en goed getimede spel van pianist Fraanje. Contrabassist Van der Feen en drummer Vatcher zijn aanwezig zonder opdringerig te worden. Met zijn prachtige toon en grote muzikale fantasie is Moore meestal op de voorgrond aanwezig. Voortdurend worden de grenzen van de subtiliteit opgezocht en tijdens hun improvisaties proberen de musici telkens uit het fraaie bouwwerk te springen." Cyriel Pluimakers, 20 Juni 2016.